We appreciate all of the love and support and welcome your thoughts, comments and prayers. We can’t wait to share them with Brigid. Glad you’re back in Falmouth, Brigid, but this really isn’t your kind of weather, brr-r-r-r-r! Stay warm. I know you’re all happy to be home. And the blue ribbons are still out there to cheer you on. Mine is looking quite perky in all this cold, snowy winter. Checked in to see how Brigid is doing and so happy to see all of her progress and accomplishments! Bridgid, it is fantastic to see your continued progress!! In the pool and saying “Hi” ….amazing! Keep up the good work! So great to see Brigid up and about! We hope to stop in and see you again soon. May be we can go outside with the dog! Love, Al, Kathy, Alison and AJ Noyes. SO good to have an update! Brigid, I can imagine the work is hard, but we all know that you can do it. Lots of us are pushing from behind and pulling from the front and standing right beside you the whole way. We will be there for you and all the Cooleens. Greetings from Corning California. I am an alumni of your dad’s college, Plymouth State. A mutual friend posted and i just wanted you to know we are sending positive thoughts to you from Northern California. B Strong, be determined and you will persevere. I truly believe by seeing your support network you will strengthen through all of us. When my nephew was ill there was a similar site set up and it lifted his spirits immensely and I know it will do the same for you. Carry on! So glad to hear that you’ve made it to Spaulding in Boston! Work hard, stay strong and know how much you inspire me and SO many others with your beauty, grace and perseverance. See you soon, Brigid!!! Wearing blue for you today Brig!! Hoping for an amazing walk tonight, wish I could be there! You are so strong and I’m so inspired by all your hard work…keep it up!!! The Cooper family from Chelsea are sending prayers to you Brigid! Knowing your brother Jack on the basketball court and his toughness we are sure he has shared that toughness with you. Keep up the wonderful progress. We will continue to pray for you daily and will keep you and your family in our thoughts! Get well soon! Brigid, I just met your dad, Paul, this weekend and it warmed my heart to see how proud he is of his little girl! I am so inspired by your strength and perserverence. God bless you and your family. So good to see you today, Brigid!! Thanks for all the smiles!!! Keep working, hon!!! Brigid, I think of you and your family every day. I hope you will be up for a visitor or two soon — when the yearbooks arrive, I am going to personally hand one to you. You will be with the class of 2013 today!!! Happy Graduation Brigid! Great news yesterday, Brigid!! Thinking of you everyday and so inspired by your strength and courage! Keep up the hard work!!! Love from all the Hickeys being sent your way!! My heart is with all of you. I pray everyday for Bridget and they whole family. I would love to come and see everyone. I am very happy to see that Bridget is recovering nicely. I will try to get in touch with you Liz. My thoughts and prayers are with you everyday. Long Island miss you. Please email me. Brigid, We are good friends with your Uncle John on Long Island. All of the members of “Team COURAGE” are praying for you and sending all of our best wishes your way! – Jim Johnson, Companions in Courage (CiC16.org). I’m glad to hear Brigid and you arrived safely. Praying for you all! We will pray for a safe arrival tomorrow and smooth transition for Brigid, for awesome progress in rehabilitation, and for provision for your family amid all the changes. We are so proud of your courage, Brigid. We love you. We continue to keep you in our prayers! So glad to read about all the progress you’ve been making! You’re definitely the Blue Ribbon winner and always have been. I’m sure there will be many more winning moments ahead for you, one at a time. Keep those blue ribbons coming! You and your family and your medical team in my heart and thoughts and prayers. 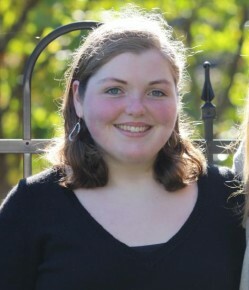 Brigid,……loved seeing your huge smile today……..you have no idea how it brightens my day. Stay strong and know how incredibly inspirational you are. We all miss you in the Art Department! Keep going, kiddo. You are an inspiration. Our thoughts and prayers are with you and all the Cooleens every day. Tonight at Banquet your awesome presence was everywhere, making us smile. My blue ribbon is going up first thing. Your writing looks wonderful. I am so proud of you. I was so moved when I saw that you had written your name! It looks great. I was not surprised though, you are so incredibly strong and determined. You are the shining star of the community that loves you. We send much positive energy your way…you have an entire community supporting you! Your love, courage, and strength are inspirational. B’s and blue ribbons on….!!! You are amazing and beautiful. Keep up the good work! Thinking of you everyday and sending all of our positive energy and love your way. We know that your strength and determination will lead you to a successful rehab. Loving the blue ribbons around town! Brigid. We are thinking of you everyday. You are so amazing and so strong! Love the B’s!!!! I pray for you and all those caring for you are guided by the wisdom and grace of our dear Lord. He will lift you up and carry you while you heal ! You have amazing courage and strength! The blue ribbons all over town remind us all just how much support and love is with you and your family, Brigid! Know that the Serunian family is thinking of you and sending love and support your way. Stay BrigidStrong! Brigid our thoughts and prayers are with you and your family, Get well soon! So happy you set up this page so we can stay up to date on Brigid’s progress. Thinking and praying for you and your family every time I ride by a blue ribbon in Falmouth! p.s. loved the photos, particularly those when you were little – you and Katie were so adorable! Even in third grade, Brigid had that kind of “quiet strength” to carry her through rough days. Brigid and her family are in my thoughts and prayers!!! Stay well!!! Ms. Hjort and her family are cheering for you! We pray every day for your full recovery and for strength for you and you family. We care!!! Love and hugs from the Noyes Family. AJ and Alison would love to come visit when you are better. Gage and I will keep you in our thoughts and prayers. 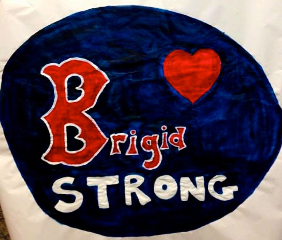 The Vasconcelos family is sending all their love to Brigid and her family… We are keeping you all close in our heart…BRIGID STRONG! WE LOVE YOU B! We’re amazed by your strength and your courage. Keep working hard every day and know we’re always thinking of you. You’re truly an inspiration to all. Thank you for posting those fabulous B’s! We are rejoicing with you, Liz and Paul, and praying for you all.